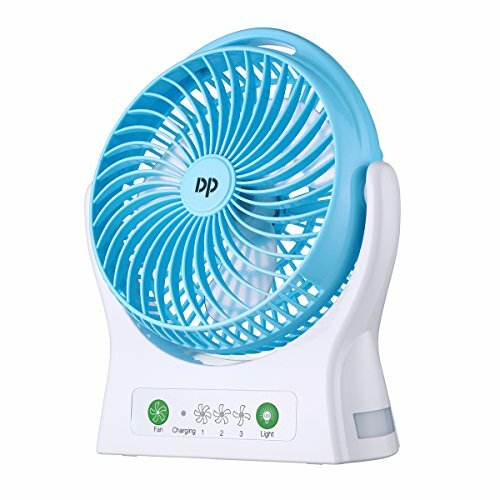 Office, bedroom, study, garage, camping, wherever or whenever you need something to cool you down, this high performance and quiet operation Miady Personal Fan can easily get the job done. We back our personal fan with an 12-month warranty. Friendly and easy-to-reach customer support is available 24 x 7. MAXIMUM AIR MOVEMENT - 7.5-Inch design and built-in powerful motor deliver strong and steady stream of cool air at 3 different speeds with Max. airflow up to 19ft/s. 4000MAH CAPACITY - Replaceable and rechargeable 2000mAh*2 Li-ion batteries (INCLUDED) provide 2-5 hours working time (depends on the speed chose). ALSO CAN WORK WITHOUT BATTERY - Simply connect the fan via Micro USB cable (INCLUDED) to any 5V USB supply like computer, power bank, USB charger, etc. 150 DEGREE PIVOTING FAN HEAD - Easy to rotate the fan's head and lock in place for precisely directed airflow. COMPACT SIZE DESIGN - 7.5 inches is perfect for tabletop use, easy to storage and not a burden to carry with for travelling. If you have any questions about this product by Miady, contact us by completing and submitting the form below. If you are looking for a specif part number, please include it with your message.